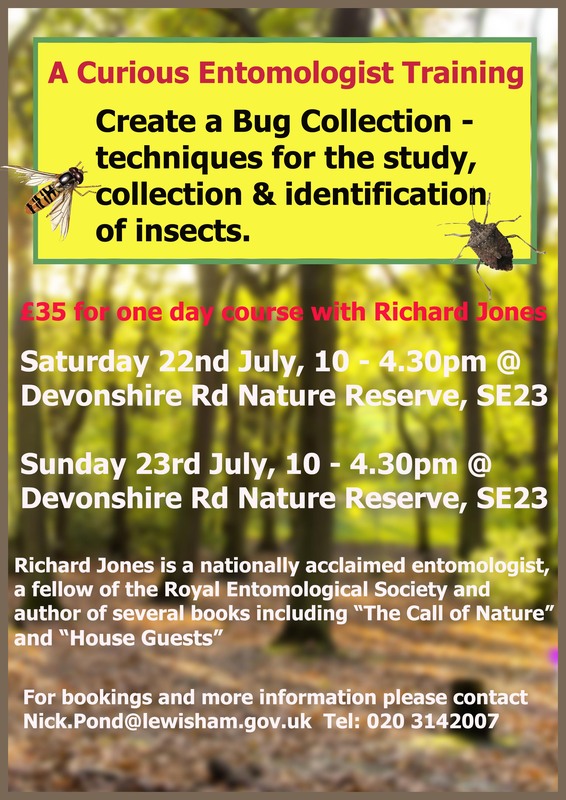 How to be a curious entomologist by Richard Jones – Saturday 22nd July at Devonshire Road Nature Reserve. Insects are everywhere. They are so many, and so varied — fascinating, beautiful, mysterious, bizarre. Through their mind-boggling biodiversity they offer us a window into the ecological complexity of life on Earth, and give us a powerful insight of the workings of the natural world. But their small size means they can easily be overlooked or ignored. However it doesn’t take much specialist equipment to have a closer look. Using simple methods and materials provided, this 1-day workshop will look at techniques to find and observe a wide variety of different insects, then how to preserve sample specimens for examination under the microscope. 76% said it was excellent value for money and 24% said they would have happily paid more than £35 for the experience. This entry was posted in Uncategorized and tagged @SE23. Bookmark the permalink.